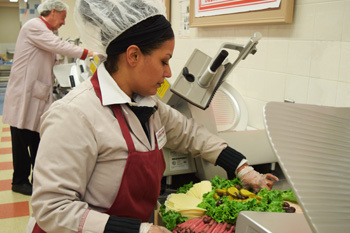 Market Basket’s Delicatessen is where great sandwiches start! Our wide selection of hand-sliced premium meats and cheeses are carefully sourced to ensure the highest quality with the best possible price. The Deli offers superior products that are organic, all natural, antibiotic free, gluten free, and nitrate free. We carry products from local suppliers as well as fine imports from Europe—the options are endless! No time? Skip the line! We are always looking for ways to enhance the shopping experience for our on-the-go customers. Located in all of our Deli Departments, you will find our pre-sliced cooler, which offers packaged cold cuts and cheeses. Our Deli freshly slices all of our packaged items throughout the day. Ham, turkey, roast beef, salami, bologna, and various cheeses can be found both in our pre-sliced cooler and behind the counter. Do not miss out on our broad assortment of salads, soups, olives, and pickles. We offer individual sizes as well as party containers. Be sure to locate our Make-Your-Own Pizza section, which includes dough, sauce, cheese, and toppings. Dinner made easy! Let us do the work for you! Don’t forget to inquire with your local Deli Manager to order a delicious platter. 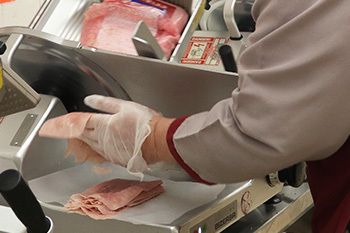 We offer an array of cold cuts, finger sandwiches, lobster, and shrimp or any custom platter you desire. Come meet us at our Deli! We are here to serve you.